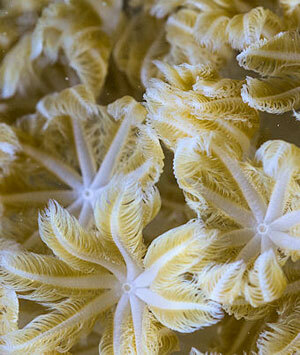 Heteroxenia fuscescens, a pulsing Xenid soft coral. Image: Photo2222 / Creative Commons. Israeli marine scientists say they have discovered why Heteroxenia corals pulsate, resolving a 200-year-old scientific mystery, appears in the current issue of PNAS (Proceedings of the National Academy of Sciences in the US). Along the way, they also discovered that corals take a half hour nap afternoon each day when the pulsing ceases. One of the most fascinating and spectacular sights in the coral reef of Eilat at the northern tip of the Red Sea is the perpetual motion of the tentacles of a coral called Heteroxenia (Heteroxenia fuscescens). Heteroxenia is a soft coral from the family Xeniidae, typically in quiet zones on the reef walls and on rocky areas on the bottom of the reef. Apparently, the motion of these polyps, resembling flowers that are elegantly spreading out and closing up their petals, is unique in the animal kingdom, and biologists and aquarists have long wondered what function this pulsing serves the corals. Except for the familiar swimming motion of jellyfish, no other bottom-attached aquatic animal is known to perform such motions, the researchers say, adding that pulsation is energetically costly, and hence there must be a reasonable benefit to justify this motion. The perpetual motions of jellyfish serve them for swimming, predation and feeding. The natural explanation would be that that the Heteroxenia’s spectacular motions are used for predation and feeding, however several studies indicate that these corals do not predate on other animals at all. If predation is not the reason for pulsating, there must be another explanation to justify the substantial energetic expense by the Heteroxenia. Pulsing Heteroxinia polyps in the Red Sea. Image courtesy Hebrew University. Maya Kremien and a team of scientists from the Hebrew University and the Technion-Israel Institute of Technology found the answers to these questions after watching several coral colonies with an underwater infrared-sensitive camera night and day. Their first surprising discovery: Heteroxenia corals cease to pulsate and take a half-hour break every single day in the afternoon hours. At this stage, the afternoon “siestas” remained unexplained. Aquatic animals affect the flow of water around them and at the same time are absolutely dependent on that flow. In order to solve the mystery of the Heteroxenia coral, the research team developed an underwater measuring device using PIV (particle imaging velocimetry), which allows measurement of the flow field just around the coral very accurately. The system consists of two powerful lasers, an image capturing system and computation ability. A special set of lenses releases a sheet of light in short, powerful pulses so that the imaging system can capture pairs of snapshots of natural particles moving with the flow. The computational system then performs a mathematical analysis of the pairs of photos, producing a huge database of flow field maps, from which the flow speed, characteristics of solutes transport, and turbulent mixing intensity are calculated. The measurements were performed at night with the support of divers who volunteered to assist the research team. It was found that if a diver lightly touched the coral, the polyps “close” and remain motionless for a few minutes, after which the coral returns to its normal pulsation activity. The researchers used this behavior in order to repeatedly measure the flow field around the Heteroxenia during pulsation and rest. These measurements led to the research group’s next discovery. Analysis of the direction of water flow indicated that the motion of the polyps effectively sweeps water up and away from the coral tissues into the ambient water. 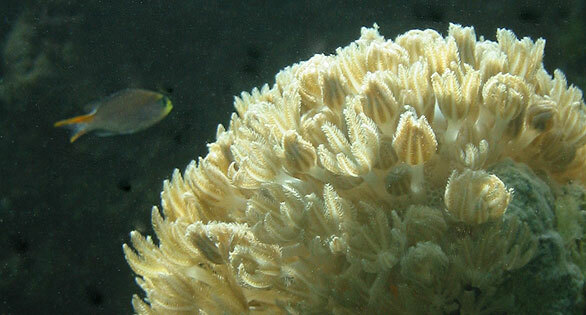 Corals need carbon-dioxide during daytime and oxygen during nighttime, as well as nutrients (such as phosphate and nitrogen) during day and night. One of the challenges for coral colonies is to render their surrounding waters rich in essential commodities by efficiently mixing the water around them. By using the sophisticated measuring system, the researchers calculated the mixing intensity of the water as a result of the coral’s pulsation. The unexpected discovery was that even though the polyps’ motions are uncoordinated (i.e. each polyp starts its period of motion at a different time), the accumulated effect of the polyps’ activity is a significant enhancement of the flow around the colony, particularly in the upward direction which sweeps water away from the coral, hence reducing the probability of re-filtration of the same water. However, these findings still did not yet answer the question of why a coral would invest so much energy to move its tentacles. After receiving a permit from the Israel Nature and Parks Authority, the research team collected a few Heteroxenia colonies from the sea in order to run a series of laboratory experiments. All corals were returned back to their original location after the experiment terminated. The Hypothesis was that the pulsation motions enhance the coral’s photosynthesis rate. Corals are among the most ancient creatures surviving on our planet. One of the “secrets” of their amazing survival abilities is that they host photosynthetic algae in their tissues. The symbiotic algae provides the coral with essential nutrients and lives off the waste of the coral. In a previous study by the same research team (results also published in PNAS) it was found that the motion of water around corals is essential in order to enhance the efflux of oxygen from the coral tissues. Without water motion, the oxygen concentration in the coral tissues would rise and the photosynthesis rate would drop. The answer to the question as to why the Heteroxenia pulsates was finally revealed through the lab experiments. In simple terms, the corals were speeding up photosynthesis in their own tissues by pumping oxygen-rich water up into the water column and away from the colony. First, the photosynthesis rate of a pulsating Heteroxenia was measured, and it was found to be on an order of magnitude higher than that of a non-pulsating colony. Next, in order to prove that the mechanism of pulsation is intended to sweep away oxygen, the researchers artificially increased the oxygen concentration in the measurement chamber so that even when the coral managed to mix water via pulsation, it was replacing oxygen-rich water with new water, which, unfortunately for the coral, was also rich in oxygen. And indeed it was found that the photosynthesis rate was low in this case, and even when the coral was constantly pulsating, the oxygen concentration remained high and photosynthesis remained low, as if the coral was at rest (i.e. not pulsating). The elegant motion of Heteroxenia has been fascinating the scientific society and capturing the attention of researchers for nearly 200 years (Jean-Baptiste Lamarck, 1744-1829), yet it has not been explained. Now, in the study of Kremien, Genin and Shavit, it was found that the pulsation motions augment a significant enhancement in the binding of carbon dioxide to the photosynthetic enzyme RuBisCo, also leading to a decrease in photorespiration. This explanation justifies the investment of energy in pulsation — the benefit overcomes the cost. In fact, thanks to pulsation, the ratio between photosynthesis to respiration in Heteroxenia is the highest ever measured in stony and non-pulsating soft corals. The findings of this study indicate that pulsation motions are a highly efficient means for sweeping away water from the pulsating body, and for an increased mixing of dissolved matter between the body and the surrounding medium. These two processes (expulsion of medium and mixing of solutes) may lead to future applications in engineering and medicine, the researchers say. [D] To speed up photosynthesis. Soft corals of the family Xeniidae exhibit a unique, rhythmic pulsation of their tentacles (Movie S1), first noted by Lamarck nearly 200 y ago. However, the adaptive benefit of this perpetual, energetically costly motion is poorly understood. Using in situ underwater particle image velocimetry, we found that the pulsation motions thrust water upward and enhance mixing across the coral–water boundary layer. The induced upward motion effectively prevents refiltration of water by neighboring polyps, while the intensification of mixing, together with the upward flow, greatly enhances the coral’s photosynthesis. A series of controlled laboratory experiments with the common xeniid coral Heteroxenia fuscescens showed that the net photosynthesis rate during pulsation was up to an order of magnitude higher than during the coral’s resting, nonpulsating state. This enhancement diminished when the concentration of oxygen in the ambient water was artificially raised, indicating that the enhancement of photosynthesis was due to a greater efflux of oxygen from the coral tissues. By lowering the internal oxygen concentration, pulsation alleviates the problem of reduced affinity of ribulose-1,5-bisphosphate carboxylase oxygenase (RuBisCO) to CO2 under conditions of high oxygen concentrations. The photosynthesis–respiration ratio of the pulsating H. fuscescens was markedly higher than the ratios reported for nonpulsating soft and stony corals. Although pulsation is commonly used for locomotion and filtration in marine mobile animals, its occurrence in sessile (bottom-attached) species is limited to members of the ancient phylum Cnidaria, where it is used to accelerate water and enhance physiological processes. I know this study/article were done a while ago, but hoping someone can answer. I have purchased many xenia frags from LFSs that pulsed vigorously in the store, but it never pulses the same in my tank. It will pulse a little, but only in the evening. My PH stays around 8.3/8.4, which I’ve heard also can be a trigger, but I know a lot of people who’s PH is lower but their Xenia still pulses a lot. So the big question for a lot of reefers like me is – how can I get my pulsing xenia to pulse? I know this study/article were done a while ago, but hoping someone can answer. I have purchased many xenia frags from LFSs that pulsed vigorously in the store, but it never pulses the same in my tank. It will pulse a little, but only in the evening. My PH stays around 8.3/8.4, which I've heard also can be a trigger, but I know a lot of people who's PH is lower but their Xenia still pulses a lot. So the big question for a lot of reefers like me is - how can I get my pulsing xenia to pulse?